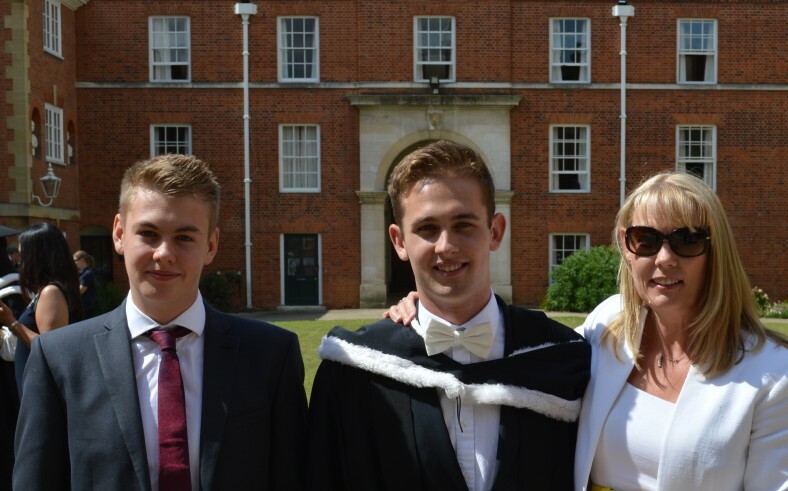 Me and my lovely boys: Nick (left) and James (middle) at James’ graduation last month. Seven years ago today, I was sat in a hospital room staring at the dreadful curtains and being told by my lovely consultant that it was a mass on my pancreas that was the cause of the excruciating back pain, loss of weight, pain on eating and nasty indigestion-type symptoms. At that point I didn’t understand the full implications of what a mass on the pancreas meant; I had never heard of pancreatic cancer before. Once I had googled ‘mass on the pancreas’ fear gradually welled up through my body in a slow, horrible realisation of what I was facing. I was lucky. I was told that surgery was an option and that my operation would be booked in for a week’s time. At that time I didn’t realise that only 10% of pancreatic cancer patients are diagnosed in time for surgery and pathetically I focussed on the very real fear of the general anaesthetic (I’d never had one before), worried that I wouldn’t wake up again. My surgery was a distal pancreatectomy and splenectomy – a 5+ hour operation to remove 80% of my pancreas and all of my spleen. Being relatively young (41) and fit, I recovered well from the surgery and left hospital 10 days afterwards. The follow-up appointment with my consultant revealed the true extent of my mass: a 5.5 cm pancreatic ductal adenocarcinoma – cancer of the pancreas. I was told I needed chemotherapy and a week later was in my consultant oncologist’s office. I told him that I wanted to live to see my boys graduate. Following combination chemotherapy (gemcitabine and cisplatin) for 6 months and then chemo-radiotherapy, my scans were clear. Regular check-ups followed with scans and blood tests – all of which revealed ‘no evidence of disease’. My oncologist finally ‘signed me off’ in April 2013. This is a story not often heard when pancreatic cancer is involved. These past 4 years since I founded Pancreatic Cancer Action I have met and got to know some fabulous people who have bravely fought and helped me raise awareness of this cruel disease. Not many of them are still alive, but all will have a special place in my heart. It is and always will be my mission to get more people diagnosed sooner – so more can have the same outcome as me. Last month I was able to be at the graduation ceremony for my eldest son and in a few years I hope to attend the graduation of my youngest son too. Although I had requested to the oncologist that he was to keep me alive to witness this important milestone in my family’s life, it probably wasn’t what he did that made it possible. It was purely the fact that I was diagnosed in time for surgery to remove my tumour. That’s why I am here 7 years later. February’s controversial pancreatic cancer advertising campaign featuring Kerry Harvey, Andy Luck and Penny Lown reached over 20 million people in the UK alone and more across the globe. 43% of those who saw the ad are more aware of the symptoms of the disease. We have managed to raise awareness of pancreatic cancer to an unprecedented level and I thank everyone who supported us through that and in particular to Kerry, Andy and Penny. It is awful that Kerry and Andy are no longer with us, but I am delighted that Penny is doing so well after finally having her tumour downstaged to operable. I would like to thank all of you who support Pancreatic Cancer Action. Patients who share their stories, those who fundraise, those who raise awareness and to those who badger their GPs to take our online training for GPs. Without you we can’t make a difference. I am now looking to be one of the 1% who survive 10 years but while I do that, I will be working hard to improve early diagnosis of pancreatic cancer so more, like me, can survive.